What is it with monkeys and jungles that captivate slots developers so much? Admittedly, some of the best and biggest slots around have featured exotic scenarios, and two of them have come from the same developer: Big Kahuna, Microgaming’s bright and breezy jungle-themed slot, or the mega progressive jackpots of the top-of-the-jungle-pile, Mega Moolah. 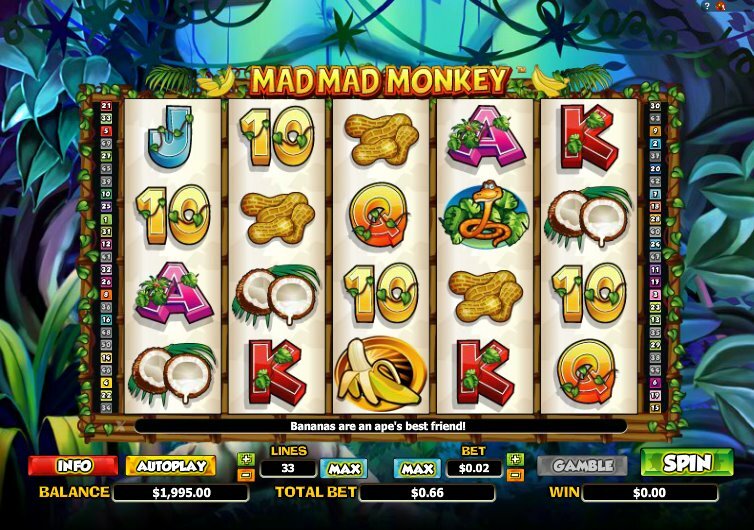 Well, Mad Mad Monkey is another addition to the Microgaming arsenal - a 5 reel, 50 pay-line slot with a huge variety of betting, giving all range of players the chance to win. Loaded with colorful characters, you know what you’re going to get here: bananas, peanuts, coconuts, parrots, and the titular mad monkeys. The 10-through-Ace symbols, draped in jungly vines, make up the reels. The Wild is the monkey symbol, substituting all symbols other than the Scatter, and it acts as a Stacked Wild on reels 2, 3, and 4. The scatter is the Mad Mad Monkey logo. Get three or more of them across the pay-lines and you’ll win 10 free spins with a 3x multiplier (a rarity in 50 pay-line slots). Not only that, but in an interesting twist it triggers the banana symbol into becoming a Stacked Wild during the bonus round. 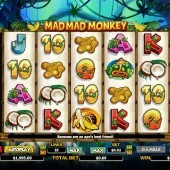 If jungle themes are your thing, you’ll warm to the monkey chants and potential big payouts from Mad Mad Monkey. There are bigger prizes to be had at the other jungle-themed slots I mentioned at the top of the review, but this is certainly worthy of your time. More pay-lines and a 3x multiplier; all that’s missing is a big bonus game. Maybe in Mad Mad Monkey 2, eh, Microgaming?